Perseus Booster “Columbia” made a series of four flights testing both a new payload section which housed our first experimental Altimeter. The Altimeter worked, but the integrity of the data recovered is in question. We’re looking into the issues. The payload bay did its job, and performed well. Columbia also flew its highest powered flight yet on an Aerotech E-15 motor. 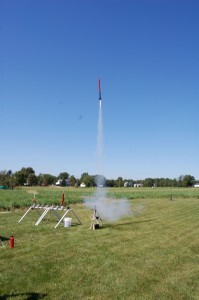 The impressive flight highlighted a stress limitation with the strength of the Airframe design of the Perseus booster. That was the down side, but from that flight we were able to find the causes, and now have data that will allow us to pick higher power moders for future high power / high altitude flights with thrust curve characteristics that will not over stress thew airframes. 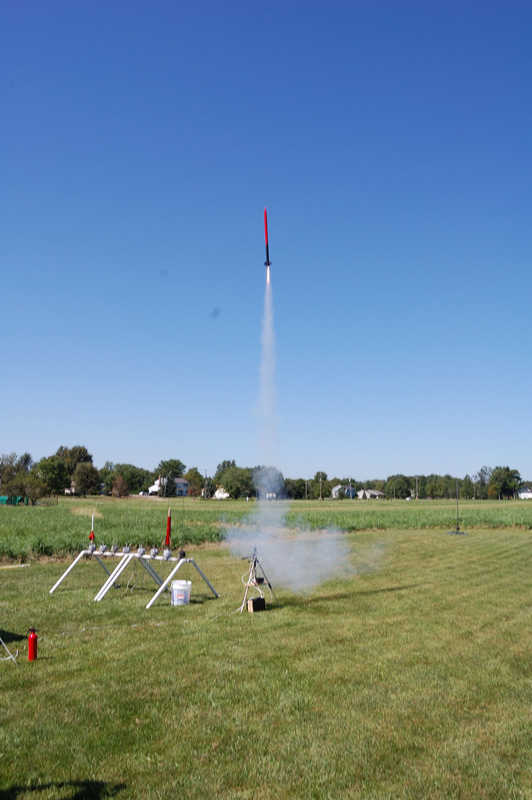 Perseus Booster "Columbia" taking to the skies on an Aerotech E-15. No permanent damage was caused to Columbia, and in fact, we flew three more flights without doing any repairs or maintenance on the booster. Our post-flight analasis of the launch shows the moment of maximum stress on the airframe. Note how the flame points in one direction, and the rocket the other. Columbia's airframe was also bending at the center of maximum dynamic pressure, just above the fins. The next scheduled Perseus Booster launch is September 11, where Perseus Booster “Eagle” will test hardware for utilizing a dual deployment recovery system, which will allow us to break the 2,000 foot ceiling we are currently limited to. More as we get closer!